Tracking is a non-competitive sport. It is judged, not with a scorecard or based on a standard, but on a pass/fail basis. The AKC Tracking Regulations state "Tracking, by its nature is a vigorous non-competitive outdoor sport. Tracking Tests should demonstrate willingness and enjoyment by the dog in his work, and should always represent the best in sportsmanship and camaraderie by the people involved." Tracking is also a integral part of the Schutzhund competition, as well as a separate sport in the SV system. Tracking dogs are trained to follow the scent of a person. Tracking TestIn tracking tests, dogs are required to follow tracks of various lengths and degrees of difficulty to find articles which were left behind by the person who laid the track. This is a controlled way to measure a dog's ability to follow a particular scent from one point to another and a reflection of what a dog and its handler might be called upon to do in the search for a person. While all dogs are born with the ability to follow a scent, not all dogs can be called upon to follow/find someone. Usually only a trained tracking dog that is willing to follow a scent that is selected by the handler can provide this service to the community. Tracking tests mimic real life situations in an attempt to fully test the dog's scenting abilities. 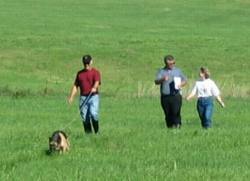 On October 16, 2011, the Nova Scotia German Shepherd Dog Club held its annual tracking trial. A thank you is extended to Louise Weaver who was this year’s Judge. Thanks as well to everyone who entered the trial, as well as the many volunteers who helped with the track laying. We hope to see you again next year. Marion Harper and GSD Quymera’s Solo Flight.